Going forward in this discussion we are bound to talk about location intelligence and business intelligence. Intelligence means in this terms collecting, classifiying and analysing the available information to get some conclusions. Location intelligence is a term that is often used by MapInfo (offering a software with the same name). While the terms of the posting “Geomarketing / Business GIS” deal either more with the internal matters of the company or deal 100% with the customer, it seems to me that the location intelligence is a mix of these two terms. It deals with informations about a customer but not just for advertising purpose. More than this it takes the results to decide where to place a new shop or office. If they collect the right information, some IT-systems will give them an outlook into future or just give them a prediction. Therefor they have to georeference all the information. Business intelligence will go a step further, which IMHO gathers all aspects mentioned until now. Internal information and information about the customer will be analysed similarily. The results will be used to improve internal aims and to optimize the customer relationship (advertising, aquire new customers). On the following slide I have tried to sort the different aspects of a GIS looking at their aims and their main attention. Please click on the thumb to enlarge. The original GIS aims at graphical portfolio management. The ongoing development of the systems leads away from the classical cartography. If cartography is nice to have — but needed — and use of the map is very customer related I would call this activity Geomarketing (GM). Therefor it is is placed at the right top of the slide. 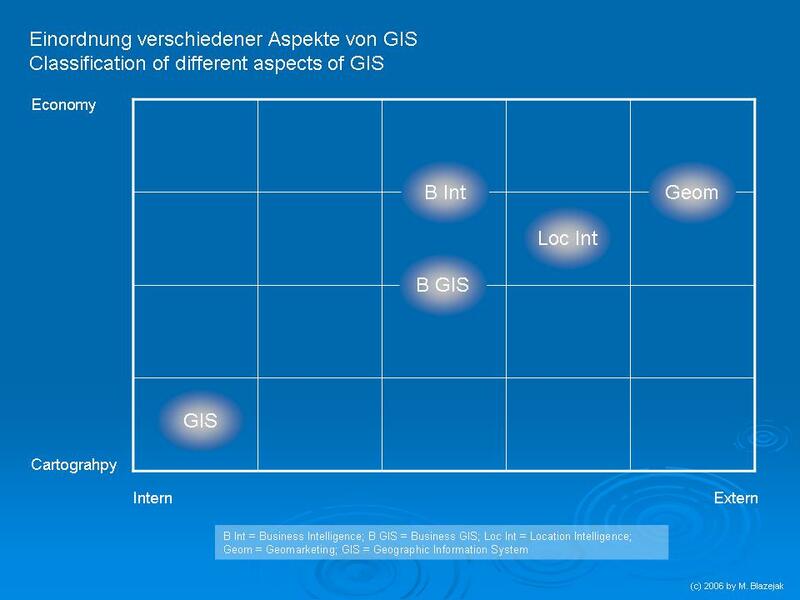 If internal aspects are as important as aspects about customer relation and if economical information is collected as well as geographival information I would speak about a Business GIS (BG). Somewhere inbetween I would place Location Intelligence (LI). In this case maps are used to show information but internals and cartography stand more in the back. The term that gathers all the tools for internal activities and customer related information is IMHO Business Intelligence (BI). Because BI uses internal and customer related information in same values but uses a bit less maps, I would place it somewhat more at the economic side of the slide. If you can find your aim, which you try to reach with this software, in this slide, you can easily find the category of software you will need. But this is just the main target of the software. Before your final decision you should think about what you can reach with your software additionally. By this I mean functions for the controlling (business administration). Once you have gathered all the information about your customers you can even plan and exactly optimize delivery tours or something like that. All of these additional aspects (i.e. controlling) I will discuss later.